Bob Gilbertson, owner/driver of the Tradicion Azul Tequila nitro Funny Car, admits that he hasn't had the best start this season in the Knoll Racing Fuels Live Nation IHRA Funny Car series but he and his Terminator Motorsports team are confident that they have found the gremlins that have been haunting them and are looking for good results at the President's Cup Nationals at Maryland Intl. Raceway. 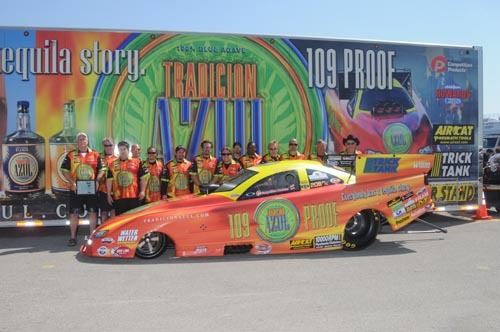 Bob Gilbertson, owner/driver of the Tradicion Azul Tequila nitro Funny Car, is on a mission and is looking to rebound at this weekend's IHRA Suzuki Motor City Nationals at Milan Dragway. It takes more than courage to drive a nitromethane-burning Funny Car dragster down a quarter-mile track at a speed of more than 320 mph. Bristol, prerace: Bob Gilbertson, driver of the Tradicion Azul Tequila nitro Funny Car, is looking to make some noise at this weekend's O'Reilly Auto Parts NHRA Nationals at the scenic Bristol Dragway. REIDSVILLE, N.C. -- Team Trick Tank Riders, Jake Gilbertson and Josh Harris knew going into the Southeast regional qualifier for the prestigious Loretta Lynn AMA Amateur National Motocross Championships that they'd have a tough fight ahead of them.� Riders from up and down the east coast were at the Rolling Hills MX track and the best of the best were there. CHARLOTTE, N.C. -- In the world of amateur Motocross racing, qualifying for the most prestigious race in the country, the Loretta Lynn AMA Amateur National Motocross Championships that will be held July 28 - Aug. 2 at her ranch in Hurricane Mills, Tenn. is a crowning achievement in any rider's resume. ATLANTA --� Nitro Funny Car driver Bob Gilbertson is chomping at the bit waiting to get back on track at this weekend's NHRA Southern Nationals at Atlanta Dragway. ROCKINGHAM, N.C. -- The last time nitro Funny Car racer Bob Gilbertson drove his 8,000 horsepower Tradicion Azul Tequila Funny Car down the historic Rockingham Dragway quarter mile he came away with a win light and a victory at the 2007 IHRA World Finals. Not only did he win the event, but he also set Low E.T., Top Speed and was the No. 1 qualifier for a clean sweep of the race and he's looking to repeat this weekend at the season-opening IHRA Spring Nationals. SAN ANTONIO -- Although he didn't have the perfect race that he wanted at the IHRA Texas Nationals this past weekend, Bob Gilbertson and his Tradicion Azul Tequila nitro Funny Car team came away from the event with a good solid start to kick off the 11-race Live Nation/IHRA championship series.